But it’s one of the best burgers around. Hear us out, for now we’ll expound. 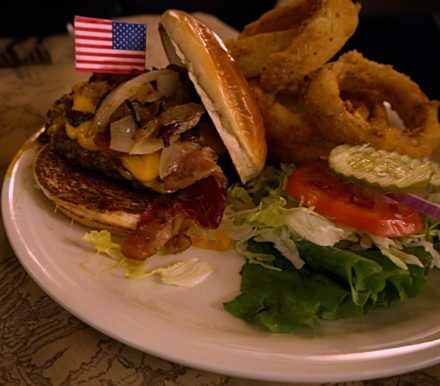 Ted’s Montana Grill is one of a growing number of semi-national restaurant chains that is focused on using local ingredients when they can. Ted’s uses those fresh ingredients to great effect. They have 14 burgers on the menu. If you can’t find a combination of flavors you like, I don’t know what to tell you, pardner. Don’s a greenhorn because he couldn’t finish his burger. 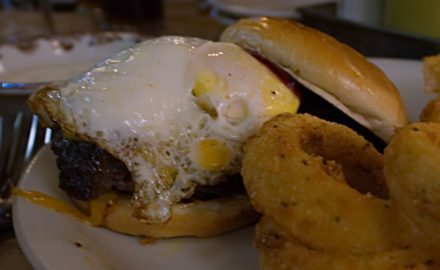 Don: I saddled up on the Cheese and Bacon Bison Burger. It was over 8 oz. of hand-pattied big sky bison goodness. The only confounding issue I did reckon, was the patty itself could have used a pinch or two of seasoning. The bacon and onions were a swell two-step partner with the lettuce, tomato, and pickles helping to corral the favors of this mammoth-sized burger. Overall an enjoyable trip to the ranch. A solid 4.0. Michael: I took a leisurely ride down the Canyon Creek. It was an 8 oz. beef patty with melted cheddar. The thick bacon was very well done. It wasn’t crispy, but it wasn’t chewy either. I had a good chunk of bacony goodness in each bite without having it escape in one big bite. The jalapenos were freshly chopped. Bright green and definitely not from a can. They were on top of the egg, though, so the little bits were all over the place. It would have been better if they were melted into the cheddar. The fried egg was over easy. The blackberry jam was what made this burger different. Unfortunately, not enough was used, and the burger was served with the top bun angled off the patty onto the plate which meant most of the jam was on the plate instead of the burger. Slather that stuff on there and keep the bun on top, and it would have been much better. Notice the jalapeños and blackberry jam are not actually on the burger. Ted’s serves a very solid burger. The big knocks were about the build and it was cooked medium well (almost well done) instead of the requested medium. The fact that it still had great flavor is testament to the ingredients. It was just left on the grill too long. I strongly recommend Ted’s. Make sure you go with a good appetite. I give it a 4.25. Overall rating: 4.13 for a rank of 25 out of 76.